In the Star Wars expanded universe, Darth Maul managed to crawl his way out of the pit that Obi Wan Kenobi kicked him down, mount himself on a shiny set of chromed mechanical spider legs, and continue to plague the galaxy with his Sith-fulness. Similarly, a cancelled Darth Maul Star Wars game is looking to make a comeback. If it had released, perhaps Darth Maul would have been on our best Star Wars games on PC list. The game was in development at Red Fly Studio, and was due for release on Xbox 360, PlayStation 3, and Wii U. In a Reddit AMA, the studio’s head Dan Borth has explained that he’s looking to approach current Star Wars custodian EA with a new version of the game, with hopes of revival. “We are currently working on a full next gen demo of all things Maul to show to the powers that be. It’s been a lot of work on our off time,” said Borth on Reddit. 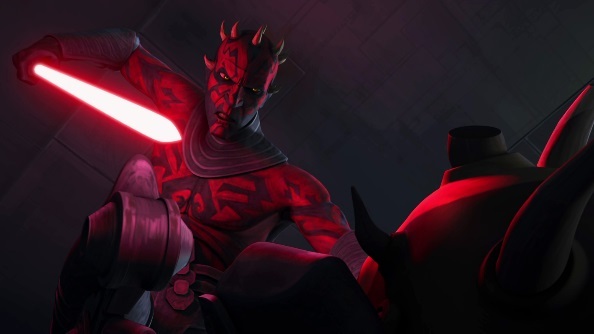 The game would be set years before The Phantom Menace, with Maul aged just 9 or 11. “We wanted to show what he went through to become a Sith. Showcase the torture the Emperor put him through,” he said. “Show how you as the player would have made the same mistakes and ended up a Sith,” revealed Borth. With Episode VII fast approaching, and EA’s Battlefront focussed on the beloved original trilogy, one Reddit user pointed out that a game using the prequel trilogy’s characters may not have a realistic chance. Borth admitted that this was a concern. “I don’t know what are chances are realistically. I would say this helps them if there were any. Hopefully EA will see the value in us reskinning our combat mechanic to be more in line with what they are thinking for Star Wars if they are not interested in Maul,” he said. Do you have any interest in revisiting the worlds and characters of the prequel trilogy?